Compare prices on car hire in Rome from all the major brands and find the best deals. When you book through us, unlimited mileage and insurance are always included in the price given. Rome lies on the River Tiber in the middle of Italy, north of Naples and south of Milan .Rome is Italy’s capital. The town is home to approx. 2.55 million inhabitants, while the suburbs are the population of 3.3 million. The city surrounds the Vatican City. “All roads lead to Rome” is a familiar concept. The city is known for having been the capital of the Roman Empire, and to be the main seat of the Pope. Rome is perhaps best known for its art and romantic city rather than anything else. The town has approx. 400 churches with paintings by masters such as Caravaggio and Michelangelo. St. Peter’s Basilica is one of the world’s largest and most ornate churches. Close by, in the Vatican, we find the world-famous Sistine Chapel with the famous masterpieces of the painter Raphael. Other famous sights include the Pantheon and the Villa Borghese, which has a nice art collection and a beautiful garden.Trastevere has many trattorias, and memories of Lady and the Tramp. Aeroporti di Rome, Fiumicino is located 22 miles outside Rome.Rome’s second airport, cialis wie einnahme Ciampino airport , located just outside the city. 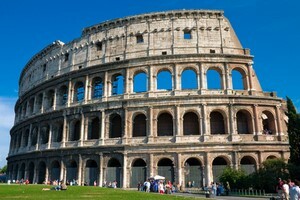 Rome is the most popular destination for booking of car rental in Italy. Car-hire.net is proud to offer car rentals at more than 20 different locations in Rome, including Rome Airport. Prices quoted are compared from several companies and ensures a guaranteed low price on car rentals.